One day you might find yourself on NM HWY 14, cruising up or down the Turquoise Trail National Scenic Byway. This byway is basically the “back road” linking Albuquerque and Santa Fe, taking you along the east side of the Sandia Mountains from Tijeras to Santa Fe. Along the way, you’ll pass through some beautiful country and through the historic mining (now eclectic arts & crafts) towns of Madrid, Cerillos, and Golden. This makes for a lovely day trip from the ABQ or SF areas, stopping at each little town along the way, learning their history, viewing their art, and drinking their coffee. Oh, and eating their burgers, though this goes without saying. Heading north from Tijeras to Santa Fe, the first town you’ll hit is Cedar Crest, just a few miles north of I-40 on Hwy 14. 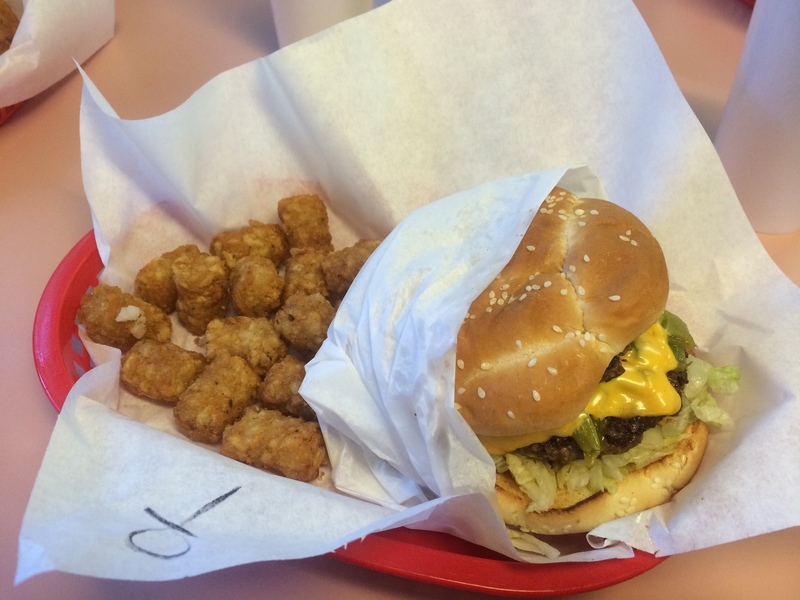 Burger Boy is pretty much our favorite place to eat on the East Mountains, when we want to be bad (but oh, so good). You won’t find any salads here (I’m guessing… I’ve never looked, don’t judge me), but what you will find is THE BEST Green Chile Cheeseburger I’ve had in the past few years. And that’s saying something, because I’ve had a lot of them. 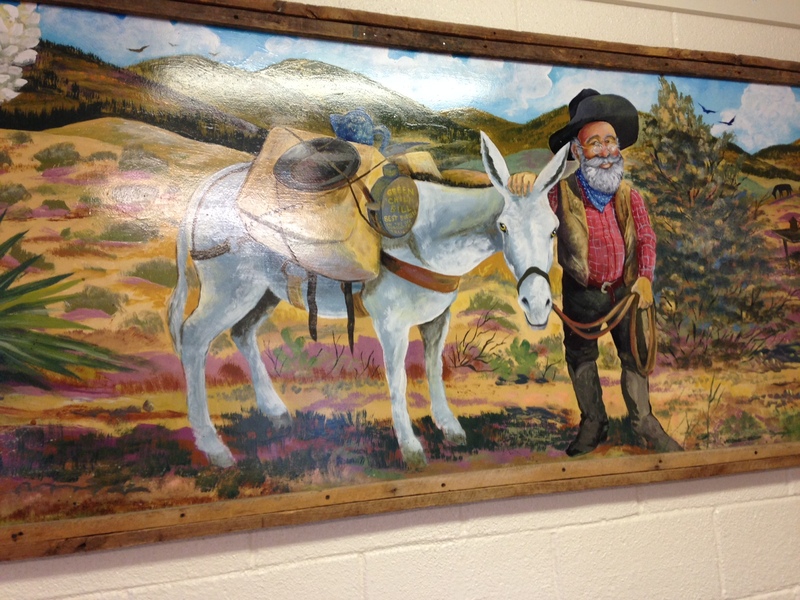 Green Chili Bill — the original Burger Boy? When anyone in the Zia-Roadrunner-Little Coyote clan has a hankering for a REAL green chile cheeseburger (the kind that drips all over the place and has a little heat in the chile) with a side of some kind of deep-fried thing (tots, fries, onion rings), we head down to Burger Boy to get our grub on. 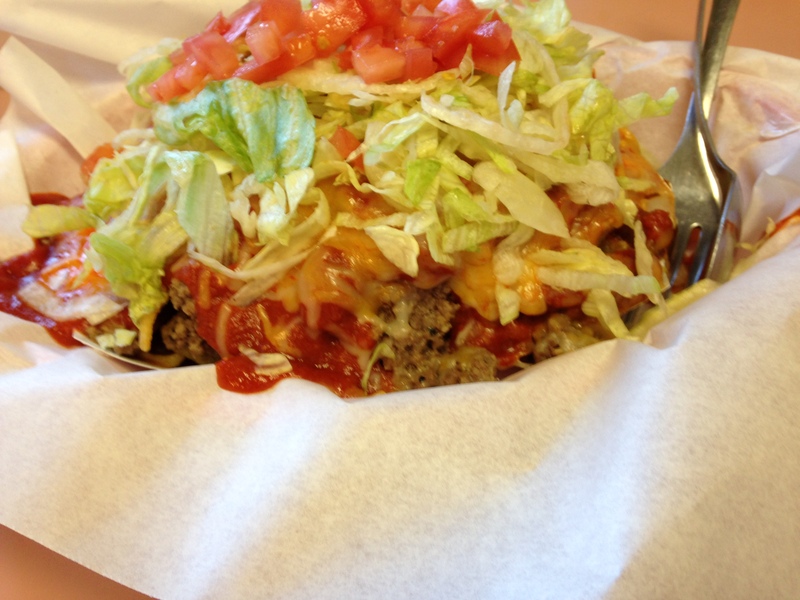 Our most commonly-ordered food is the green chile cheeseburger, natch, with tots or fries. Because this is ALWAYS WONDERFUL and this is just what we eat here in New Mexico. I recommend ordering this burger with everything on it except pickles. Pickles and green chile just don’t quite work together. This is not a fancy burger. It’s not kobe beef, it’s not spritzed with truffle oil, and it doesn’t come stacked 8″ high with a steak knife stabbed down the middle of it to hold it all together. It’s just a burger. THANK YOU, BURGER BOY. Green Chile Cheeseburger with Tater Tots — how could you not order this?! This one time, I got it without cheese. It was still awesome. The onion rings are a little on the thin side for me (not much onion) but they were still crispy and tasty. LOOK AT MY GREEN CHILE! Green Chile Hamburger — just, yes. Go eat at Burger Boy already. OK, if you can bring yourself to branch out from the GCCB family of products, your next step should be the taco plate. 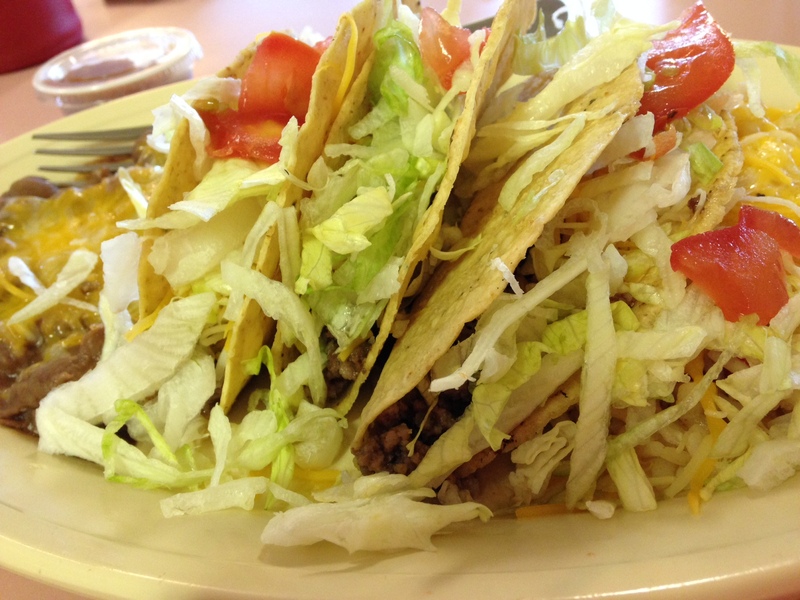 This is your standard taco plate, but it is SO GOOD. The tacos are crispy, the ground beef is juicy and flavorful, and these babies go down really easily. Like you could eat 6 of them, that kind of easily. I had to wait for the weather to cool down a tad before I ordered the Frito Chile Pie. It seems like a cold-weather food. So when the temps dipped below 80 (ha), I headed straight over there and ordered it. This starts out like your standard Frito pie, but where traditionally you would have chili (with an I — the red stuff with meat and beans and spices), here you have chile (with an E — the New Mexico stuff with red chile peppers and awesomeness). The chile was flavorful and spicy (just this side of too spicy). There were ample corn chips and plenty of iceberg lettuce and tomatoes on top. There was also a heaping scoop of ground beef and lots of melty cheddar cheese. It was just… wonderful. If you can tear yourself away from the GCCB, this is a great option to try. Frito Chile (with an E) Pie at Burger Boy. With all that lettuce you can pretend it’s a salad! 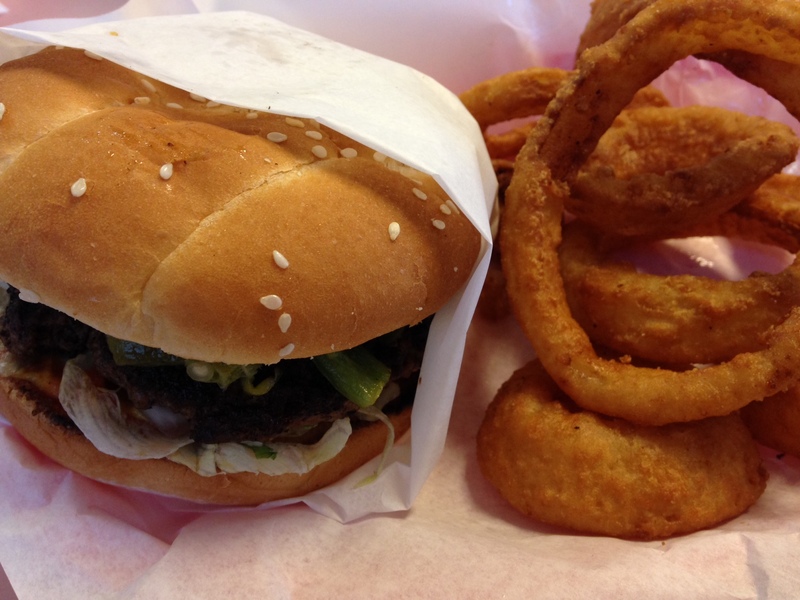 Everything we have tried here at Burger Boy has been fantastic. 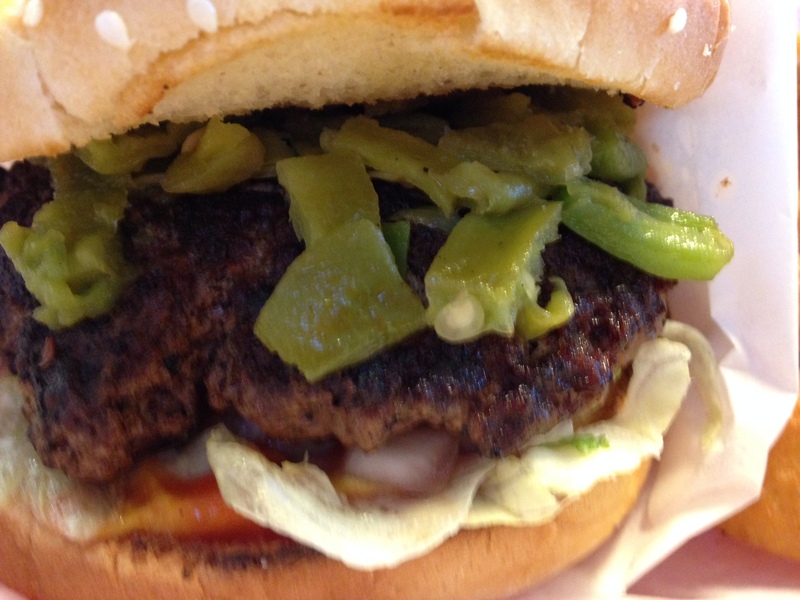 That’s why anytime feel we have somehow “earned it,” we head on over to Burger Boy and chow down on some of the best Green Chile Cheeseburgers this side of the Owl Café (and that side of it, too … all sides).